An accurate, detailed and complete guide on how to unlock every achievement in Super Mega Baseball 2. 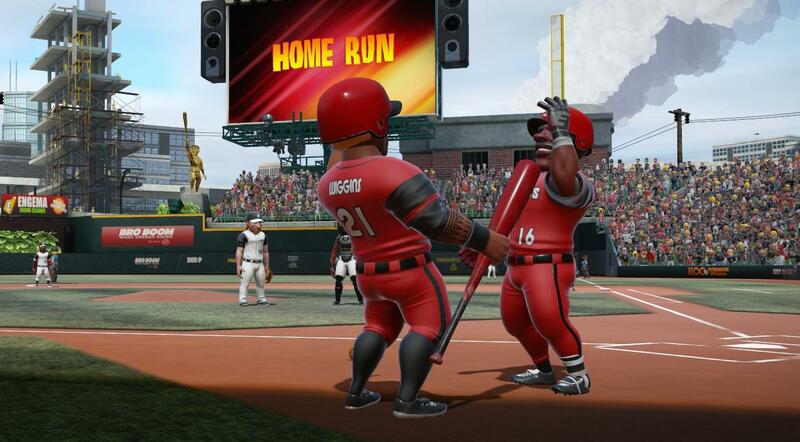 Hit a home run against any CPU team in any mode. This achievement cannot be unlocked in co-op. Have all nine batters make a single appearance in one inning. They do not have to reach base; they just need to appear before the end of the inning. This is easily done at 15>Ego. This achievement cannot be unlocked in co-op. Also known as a double-play in baseball. Achieve this at any point in time against the CPU and it will unlock. This achievement cannot be unlocked in co-op. Achieve a ten-run lead against a CPU in either the Seaon or Elimination mode. The CPU can score, but you'll have to extend the lead at least ten runs for this achievement to unlock. This is easily done at 15>Ego. This achievement cannot be unlocked in co-op. From the main menu: Customize --> Teams --> Edit Team --> Edit Logo/Team/Colors and create a new logo. Perform any change, save it and the achievement will unlock. You'll need to use a power swing (X button on controller) and hit the ball with 95% power or more. You do not need to hit a fair ball; just make contact. With a little practice this should be a fairly easy achievement to get; just time the power swing as shown in the example here and you'll have no issues. This achievement cannot be unlocked in co-op. Assuming you're using a controller, catch a ball by diving. You can dive by either pressing RT or down on the right thumb stick. It's all about timing and having the opportunity to do it. This achievement cannot be unlocked in co-op. Also known as a grand slam, you'll need to have a runner on each base and then hit a home run. It can be tricky to set up, but the best way to do it is play small ball (no power swings) and avoid any extra-base-hits/runners from advancing and then go for the home run. It's best to have a batter prone to hitting it out of the park, or substitute a batter for someone more likely to achieveme the feat. In other words, don't rely on your pitcher to come through for you. This achievement cannot be unlocked in co-op. When a CPU opponent tries to steal, you need to throw them out to earn this achievement. It's pretty straight forward, so just wait for the chance. A good way to increase your chance is to intentionally walk a batter with an above-average speed stat to get them on base. This achievement cannot be unlocked in co-op. This one can be fairly difficult since a lot of it relies on luck (or lack thereof). With a two-strike count, you need to connect and foul off four straight pitches without the ball going fair or striking out. For those not familiar with baseball rules, do not bunt, as a foul ball with two strikes will be counted as a strikeout. This achievement cannot be unlocked in co-op. Obtainable only by throwing power pitches (X button), you need to position the reticle over the dot as close to the center as possible. You need to do this (5) five times in one game. It'll take some practice to be able to do it on a fairly consistent basis, so just keep at it. To pitch a shutout, you need to pitch an entire game with a single pitcher and allow zero runs. You may allow walks, hit batters and hits, but no runs can score all game. The cycle means a single batter has hit all potential base amounts (single, double, triple) and a home run. A grand slam is not included in the cycle and hitting one will count towards the home run portion of the achievement. This achievement cannot be unlocked in co-op. Strike out 15 batters in a single game against the CPU. I suggest lowering the ego down to "0" to make this one easier to accomplish. Keep the ball out of the center of the strike zone and work the corners. This achievement cannot be unlocked in co-op. For this one, you'll need the same base runner to steal from first base all the way to third. Make sure to do this with someone that has a high speed rating. I recommend lowering the ego to "0" for this one as well to increase your odds of a successful steal. This achievement cannot be unlocked in co-op. I recommend lowering the ego to "0" for this one as well to increase your odds of a successful bunt. Make sure to bunt with a batter that has a high speed stat to insure you get to the bag before the throw. To bunt, hold the (B) button on the controller and position the bat with the joy stick. You'll want to practice a bit with bunting. Try bunting down and away, preferrably down the third base line so the CPU has to run further and throw further, allowing you more time to make it to the bag successfully. This achievement cannot be unlocked in co-op. Self explanatory, but difficult in practice. Using a batter with high power/contact, you'll need to both get a decent pitch and power up your swing correctly. Hitting a home run on a lower difficult is easy, but it'll take some practice before you're able to hit one 500+ feet. Get those PEDs a'flowin'! To increase a player's stats, go to a previously made custom team as mentioned above in the achievement "Gotta Look Good to Play Good" and select: Player Editor. Now select any player and move over to their stats, crank them up to 99 and the achievement will unlock. Simple, right? On a lower difficulty (ego), intentionally let the CPU earn five runs in a Seaon or Elimination game before you start actually playing and take the lead. You must win the game for the achievement to unlock. Get a total of 500 fair ball hits that you successfully reach the bag on. Hitting a fair ball and being thrown will not count towards the total. This is one you'll get naturally over time. This achievement can be unlocked in co-op. On a low difficulty (ego) setting, intentionally walk three batters in a row. I recommend walking the 6th-8th spots (assuming you have two outs) in the first inning to get the pitcher up. With the game only have just begun, they won't substitute him and he/she should make for an easier third out to unlock this achievement. In a single inning, the opposing team needs to make two errors, whether that is a wild pitch, overthrowing, failing to catch a pop-up...etc. An easy achievement to earn, as you can play it on any difficulty and any length, so if you're havng trouble, just lower the difficulty (ego). This can be rather difficult due to how specific it is, but you need to play as the home team in order to do this (home teams bat at the bottom of each inning). This can be done either in the bottom of the 9th or extra innings. In order to have an "on fire" or "jacked" player, they need to be hitting/getting on base consistently. It's obtainable more easily on a lower difficulty (ego) to have someone "jacked/on fire", but it still is an extremely situational achievement. This achievement cannot be unlocked in co-op. This achievement is actually really easy on lower difficulties (ego). If you're having a hard time coming up with four in a game, lower the ego 15> and you should be fine. Just make sure you're using power swings (X button) and timing the charge properly. Much like the "A Touch of Clutch" achievement, to get a CPU opponent "Rattled", you need to dominate their team. Striking out a batter multiple times will often lead them to become "rattled". This achievement cannot be unlocked in co-op. On higher difficulties (ego), a batter may not even bat four times, so remember this when playing. The lower the difficulty, the higher your chances are of batting through the order quickly because the CPU isn't as skilled. Here you'll want to pick one batter to constantly strike out with. Preferably not the pitcher, as you may have to substitute them mid/late in the game due to a high pitch count, stamina or injury forcing you to start over or run out of time with a different batter. So pick one batter and just swing early on every pitch. Easy peasy! This one isn't terribly difficult, despite how it sounds. I highly recommend playing on a low difficulty (ego) for this one. This can only be accomplished during a regular season series, as that's the only way you can achieve that many plate apperances. All 3 are starters so if you plan on playing the whole game use whomever you want to pitch the most innings last. Win any type of Custom Season with any team on any difficulty (ego) setting you desire. Once you have someone on base, substitute said person on base for a pinch runner. On the very next pitch, you'll have to steal and be successful. If you're thrown out, it will not count. The easiest way to do this is would be to play on an easier difficulty (ego), as the CPU is more likely to swing at junk and strike out if you keep the pitch type random and keep the ball out of the center of the strike zone. A perfect game is difficult. You need to accomplish the following goals all at the same time to have the win count as a perfect game. Win any type of Custom Elimination with any team on any difficulty (ego) setting you desire. Win any type of Standard Season with any regular team on any difficulty (ego) setting you desire. For this achievement, you need to have a single batter bat in 6 RBIs (Runs Batted In), but that batter cannot physically cross home plate themselves (thus scoring a run). I recommend doing this with the #4 spot (cleanup) for the best results. Remember to avoid homeruns, as that will count for runs and invalidate this achievement. This achievement cannot be unlocked in co-op. In a Standard match (Season, Exhibition, Elimination), you need to beat a team on the hardest difficulty (ego) level against a CPU opponent. This cannot be done with any custom settings and cannot be done in co-op. In other words, hit a grand slam. To do this, you need to load the bases (a runner on each base), substitute the current batter for a pinch batter and then hit a home run (grand slam). A complete game is defined as a single pitcher pitching for all nine innings without him/her being substituted for a new pitcher at any point in the game. You'll need to do this ten different times against a CPU opponent. This achievement cannot be unlocked in co-op. Play and win a Standard Season with a difficulty (ego) rating average of 80+. You can adjust the ego for both hitting/fielding, but they need to average out to a minimum of 80 throughout the whoel season for this achievement to count.